Diploma Frames - by Tamis Fastfrrame Frame Shop and Custom Framing Service. We specialize in two things – making your diploma look great now and in the future. We help you chose just the colors that will look good with your diplomas and then use the proper materials and techniques so that your document lasts as long as possible. We do this by using exclusively acid-free materials, reversible mounting techniques and glass that is specially coated to eliminate the light that makes things fade. When I re-read that sentence, it sounds like we are probably super expensive. But give it us a shot – our prices are very competitive and our finished product is second to none. We’ve been at this business quite awhile and have know all the little tricks that allow us to turn out a great product at a competitive price. One of those tricks is that we carry a line of affordable frames that we purchase in bulk and pass the savings along to you! 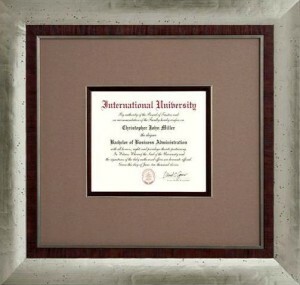 Browse through our “Gallery” page to get some diploma frames and other diploma related ideas. Grab a paint swatch, or snap a photo of your room with your smartphone, if you want. But most of the time, we find that if we frame “for the art”, it will look good in your room. We can help you with color selection and layouts and even provide an emailed layout, if you like. With diploma frames, some like to include a school logo. Bring along something with a small logo or emblem. We can work with a sticker, pin, letterhead or even a digital file. This adds very little in cost but can make it look very nice. 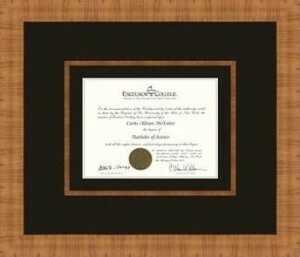 All diploma frames and diploma memorabilia framing work is done in our shop by trained professionals. We do just about everything from mat cutting, frame cutting and joining, installing the glass and assembling the whole project on site. We take a lot of pride in what we do and offer a Satisfaction Guarantee. We want to make sure your photo both looks nice and is preserved for years to come.